Created 7 years ago, edited 6 years ago. 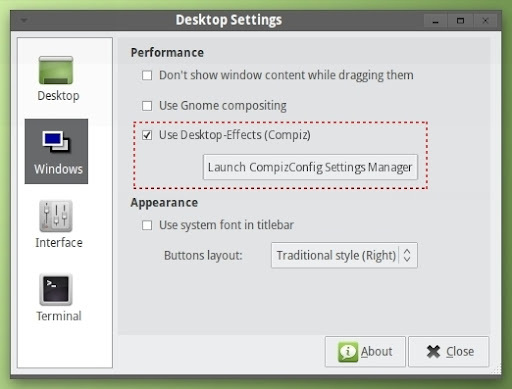 It would be nice if MATE users could switch Compiz ON/OFF with Desktop Settings (mintDesktop) like below. In this connection, I hope the feature switching Compiz ON/OFF would be built in @blueXrider 's idea "Post Installation Configuration", and if any user want to switch Compiz ON/OFF later, he/she would be able to do it easily with this new feature in Desktop Settings. I think this feature would be very useful for Linux beginners. Deleted "'Compiz Fusion Icon' is not installed by default, and"
kazztan0325	 Thank you @vincentv for your consideration. blueXrider	 Maybe another idea or direction would be to modify the "Compiz Fusion Icon" to include "Compiz on/off" that way it could remain on the panel verses having to go Menu> Desktop Settings> Compiz> use desktop effects? Adding a small script to the config file might be the ticket. I finished editing and replacing the Screen-shot now. Thank you for your very beneficial advice!! I would like to edit the screen-shot by this few days. DJCrashdummy	 yes, i also miss the Compiz-Settings Manager!!! but for newbies it would be better to "explain" what Compiz is! --> maybe just change the line to "Use Desktop-Effects (Compiz)"!? It is not only be helpful for new users but also be beneficial in the promotion of Mint. I think, it is easy for experienced Linux users to make the most of ability of 'Compiz Fusion Icon' or 'DisPlex', but it is not easy for Linux newbies. I hope this additional item in Desktop Settings would be helpful for newbies. blueXrider	 Until we get some sort of a configuration wizard. I dealt with Compiz. I took control of my desktop with DisPlex. Might want to give that a whirl. but it doesn't run at system start up by default, does it? Anyway, now I removed the part which you pointed out to me. SeventhReign	 Compiz Fusion Icon is installed by default in Mint 11.